The Great Pyramid of Giza has been extensively studied (and looted) since its construction 4,500 years ago. But some tunnels are too small or too fragile for human archaeologists to explore - that's when they send in the robots. 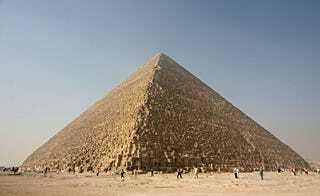 The Great Pyramid has two finished, massive chambers placed one on top of the other. The higher of the two is known as the King's Chamber and is believed to have housed the pharaoh. It was placed higher up so that the pharaoh's soul could more easily escape his tomb and head on into the afterlife. The second, lower chamber is the Queen's tomb, belonging to the pharaoh's wife. And one shaft in the Queen's Chamber has been nothing but trouble for archaeologists. Two robots have been sent down the shaft in the past. The first one ran into a door that it couldn't get pas. The second robot was built to cut through that door, but it soon found its own impassible obstacle. So now, researchers at the UK's Leeds University have built a third and, they hope, final robot that will be able to get through any and all big doors that stand between it and whatever is at the end of the shaft. "All the robots were designed from scratch to do as little damage to the shafts as possible. The previous robots both used tracks that scrubbed away at the floor and ceiling as they moved. We use soft brace pads to grip the walls, like an inchworm or the technique that rock climbers use for ascending 'chimneys.' The wheels don't need to grip, they need to slip as much as possible." The robot has all the latest gadgets. It's got a fiber-optic camera for peering around corners, an ultrasonic probe for testing the rock, and even its own mini-robot that can get through spaces that are less than an inch in diameter. The team is also prepared to swap in new tools for the robot, depending on what obstacles it encounters. Equipped with all these gadgets, this robot has an excellent chance of being the first to see the end of that shaft in nearly five millennia.